Can I Restart An iPad Without The Power Button? Yes! Here's How. You are at:Home»iPhone»Power»Can I Restart An iPad Without The Power Button? Yes! Here’s How. Can I Restart An iPad Without The Power Button? Yes! Here’s How. You want to restart your iPad, but the power button isn’t functioning. Broken buttons can be a bother, but fortunately you can restart your iPad using AssistiveTouch. In this article, I’ll show you how to restart an iPad without using the power button. Restarting an iPad without the power button take two steps if it is running iOS 10. First, you’ll have to shut down your iPad, then connect to a power source using your Lightning cable. Don’t worry: if your iPhone turns off, but the power button is broken, you can always turn it back on by plugging it into any power source such as a USB port on your computer, wall charger, or car charger! We’re going to use AssistiveTouch to restart your iPad without the power button. AssistiveTouch creates adds a virtual Home button to your iPad, which comes in handy when any of the physical buttons on your iPad are stuck, jammed, or completely broken. To add the AssistiveTouch virtual Home button to your iPad, open the Settings app, then tap General -> Accessibility -> AssistiveTouch. Tap the switch next to AssistiveTouch to turn it on — the switch will turn green and the virtual Home button will appear on your iPhone’s display. To restart an iPad without the power button in iOS 10, tap virtual AssistiveTouch button which will open the AssistiveTouch menu. Tap the Device button, then press and hold the Lock Screen button like you normally would on the physical power button on your iPad. After a few seconds, you’ll see the red power icon and the words “slide to power off” appear near the top of your iPad’s display. Slide the red power icon from left to right to shut down your iPad. Now, to turn it back on, grab your Lightning cable and connect it to any power source like you would when you normally charge your iPad. After a few seconds or minutes, the Apple logo will appear in the center of your iPad’s display. The ability to restart an iPad without the power button was added to AssistiveTouch when iOS 11 was released. With earlier versions of iOS (10 or older), you used to have to turn off your iPad using AssistiveTouch, then plug it back into a power source. This process was a bit tedious, so Apple added a restart button to AssistiveTouch. To update to iOS 11, open up the Settings app and tap General -> Software Update. If an update to iOS 11 is available, tap Download and Install. The update process can take awhile to complete, so be patient! Note: iOS 11 is currently in beta mode, which means that it’s not available to all iPad users yet. All iPad users will be able to download and install iOS 11 in Fall 2017. Tap the AssistiveTouch virtual Home button. Tap Device (look for the iPad icon ). Tap More (look for the three dots icon ). Tap Restart (look for the triangle inside of a white circle ). Your iPad will shut down, then turn back on approximately thirty seconds later. 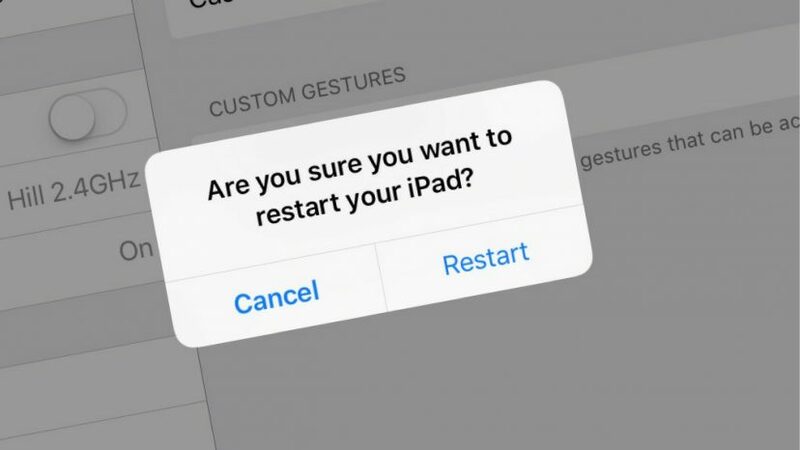 You’ve successfully restarted your iPad without the power button using AssistiveTouch! This issue is incredibly frustrating, so we encourage you to share this article on social media to save your friends and family the same headache. Feel free to leave us a comment down below if you have any other questions about your iPhone or iPad and, as always, thanks for reading! Previous ArticleHow Do I Make The iPhone Display Darker? Here’s The Fix!